When Anoushka, our daughter was born almost a decade ago, one of the things we stopped doing was going to a pub. It came to be restricted to when our parents were visiting and could babysit initially, to when Anoushka visited grandparents over the holidays, later. Gradually, around two years or so ago, we found a few pubs which passed my rather stringent personal requirements of being able to take a child. Even then, I still restrict these visits only to lunch time ones at completely non-peak hours. I know a lot of parents, like me, are looking for such places and let me begin this post by saying that Three Dots and Dash in the day time is where I will take my now almost 10 year old, comfortably. Three Dots and a Dash has been around a while. In fact, the celebrations are still dying down on it turning Ekahi (one in Hawaiian) recently. We were invited a little before the anniversary to experience the pub. It was also Sudhakar's birthday and made for a perfect treat of pub outings that we rarely do. Up a wooden staircase you go, to come up to a semi open air seating area - while one side has bar stools and high tables, another has low seating in white with wall fans to keep you cool. Strategically placed high stools and tables are also yours for the taking in the outdoor section - keeping you in the open but well shaded. And then for the bigger parties, you have the long low-seater sofas with a low table right next to the bar. And that is where we were seated. It had been so long that when we saw the special menu for sheeshas, we did not hesitate. A mild green apple one was called for and it made for a great start. Just right on the flavour and a member of the staff constantly making sure that the coals were rekindled. It accompanied us all through the meal. The idea was to go through a range of dishes in the form of nibbles and starters and if the tummy allowed for it, a main course as well. And we have always been unorthodox in the manner in which we order. We began with a main course dish of Pork Steak with maple glazed apple and bacon mash and a gorgeous corn on the cob to go with it. This is a dish with nice diced chunks of steak - with the perfect proportion of fat to meat, made sticky with a glaze of maple syrup and with some heat from chillis. Besides the fact that this dish hits several right spots and runs the risk of you making some unparliamentary sounds of pleasure, the apple and bacon mash is good enough to cause a war over. The corn was coated with butter and house mix of spices making it spot on. Now Three Dots and Dash is a Hawaiian themed pub and the drinks are served up in stylish drinkware that bear close resemblance to totem figures and are served on a bed of dry ice for that dramatic effect. This video shows you the first two delicious drinks we had. We next had the Polynesian Baked Poisson - marinated fish in banana leaves - made with Basa, which I don't generally care much for, but this one had taken to the marination rather well. That is one of the saving grace traits of Basa, that it works very well in the right hands and it most certainly did here. Each parcel opens up to a steaming chunk of fish that is covered in a lightly spiced and seasoned marinade. The salad that accompanied it and most dishes after this had a special touch to it - house made potato sticks that did not turn soggy, even if you got to your salad towards the end of the dish. And the pink streaks across the plate is a beetroot mayo also made in house. Nice little touches to dishes here. We saw the Herb Cheese Stuffed Mushroom on the menu and decided on it. What came were herb and cheese stuffed mushrooms that were encased in a bread cover that is crumb fried, sliced and served with a chilli mayo dip. While the herb stuffed mushrooms were great on their own, the bread casing ended up being a little too thick for us to completely enjoy the mushrooms. And so we picked them from the casing and had them. We shared our feedback with the kitchen and they did mention that they would consider another approach. We next had the Honey Mustard Chicken - Sudhakar can vouch for the fact that I get regular urges for something hot, gooey, spicy and chicken - this is that one dish that I will always think about when I have the urge next. Fried chicken wings, served up in a honey mustard sauce that packs a good deal of flavour in every bite. You ave to dive in with your fingers with this one to enjoy it thoroughly. We did! and took our own sweet time too. The apple and carrot julienne salad that accompanies it gives added crunch and texture to the dish. Another drink on the cards for us - The Forbidden Island - this A four alcohol wonder with Vodka, White Rum, Gin, Brandy, Apple Juice and Red Bull. 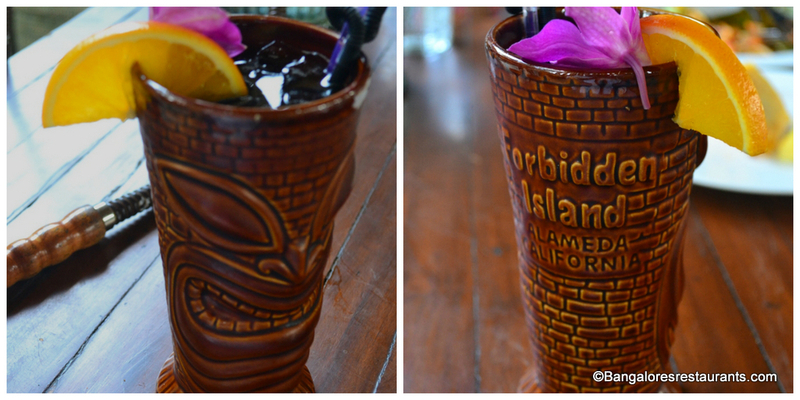 Its called Forbidden Island perhaps for the mix of alcohols, but it is done with a great deal of attention to balance and flavour and is a drink you can nurse. So now that it was Sudhakar's birthday and we politely refused to have a cake cut (birthday boy didn't want to make a big deal of his birthday), we were encouraged to celebrate in the next best way - SHOTS!! Now I don't really know the names of the two shots that we had but Victor, my man, they were good ones! We did make room for one pizza, which you should too if you are there. The Chicken and Mushroom with pesto and spinach is what we had and it was a wonderful thin crust pizza, with a some great topping. Make the room, you won't regret it. A Chocolate brownie with ice cream to wrap things up and it was a good way to spend the afternoon on Sudax's birthday. The ambience at Three Dots is great for those who like a long session of good food and drink, with some good music playing. A meal for two hits the Rs 2500 category. The loos are clean.